Winner GOLD AWARD for Interior Design, and SILVER AWARD for Autobiography/Memoir at the 2015 Benjamin Franklin Awards FINALIST Foreword Reviews IndieFab BOOK OF THE YEAR AWARD Foreword by Nobel Peace Prize Laureate Lech Walesa. Introduction by Chief Rabbi of Poland. Includes 11 short videos of original historical film and audio material via QR code and URL; more than 150 photos, maps and illustrations. Free, downloadable Educators' Guide correlated to Common Core standards, grades 9-12. "At once absorbing, inspiring, and tragic." -- Publishers Weekly"Poignant, haunting, gritty, and bursting with realism...brings a deeply moving and unique perspective to World War II." -- Foreword Reviews "If there is going to be a war, I do not want to miss it." So writes Julian Kulski a few days before WWII begins, in this remarkable diary of a boy at war from ages 10 to 16. As the war unfolds through his eyes, we are privileged to meet an inspirational soul of indomitable will, courage and compassion. At age 12 Kulski is recruited as a soldier in the clandestine Underground Army by his Boy Scout leader, and at age 13 enters the Warsaw Ghetto on a secret mission. Arrested by the Gestapo at age 14 and sentenced to Auschwitz, he is rescued and joins the commandos. 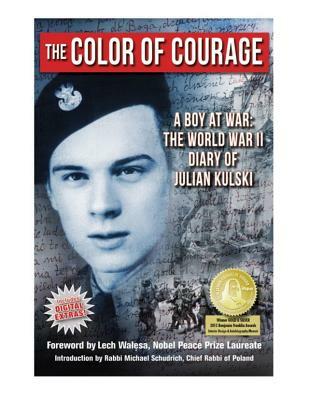 At age 15, Kulski fights in the 1944 Warsaw Uprising. He ends the war as a German POW, finally risking a dash for freedom onto an American truck instead of waiting for Soviet "liberation." Also includes: 2 Appendices, Contextualizing historical material, Discussion Questions, and Index. Julian E. Kulski was born in 1929 in Warsaw, Poland. A graduate of Yale University (M.Arch) and Warsaw Institute of Technology (Ph.D. Urban Planning), Kulski is a semi-retired architect who as taught at U.S. universities and consulted for World Bank. He has been published multiple times and is a frequent speaker. Kulski resides Washington, D.C.